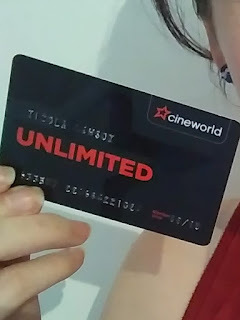 I'd like to start off by saying that this is in no way an ad for Cineworld, I just happen to live close to 2 of them and really like films, so I absolutely love my unlimited card. For those of you who don't know, Cineworld Unlimited is a where you pay a set amount per month and then you can see as many films as you want at not extra cost unless it's for an IMAX or 4DX upgrade. You also get discounts on snacks and drinks at the cinema and at various restaurants. To make having an unlimited card worth it you only have to see 2 films a month, which is fairly easy, but personally I like to get my moneys worth. For me, only seeing 2 films a month would be the food equivalent of going to an all you can eat and just having a main and dessert. I'm not sure exactly how many films I see a month, but my record is 6 in one day and 3 in a day is the average for me. I use cinema days as an escape from the world, just bouncing from film to film forgetting that everyone else exists. People think I'm crazy for going to the cinema alone, but I feel like it doesn't need to be a group activity since I don't allow talking in films anyway. The one downfall of Cineworld Unlimited is that it enables me to see some awful films that I never would have gone to see if I had to pay for them. For example, my 6 film day was going to be just a standard day seeing 2 or 3 films until I decided to stick around for a midnight showing of Star Trek Beyond, so to kill time in between I saw the lady Ghostbusters, I regretted it even though it was free. Honestly though, I can't recommend it enough for anyone who loves cinema, I get to see all sorts of films I wouldn't necessarily see but thoroughly enjoyed, such as Book Club last week. A funny film that I wouldn't have thought to watch if it wasn't just starting as I got to the cinema. Once again, not an add, I just happen to get a lot of use out of my unlimited card and thought other people might benefit from my experience.